At 1,084 metres above sea level, Kjerag is the highest peak in the Lysefjord. Here you can take a picture of the Kjeragbolten boulder and enjoy the view from the mountain plateau. Kjerag is also a popular attraction for base jumpers and mountain climbers. At 3,556 feet above sea level, Kjerag is the highest peak in the Lysefjord. Here you can take a picture of the Kjeragbolten boulder and enjoy the view from the mountain plateau. Kjerag is also a popular attraction for base jumpers and mountain climbers. Kjerag is a seasonal hiking destination. 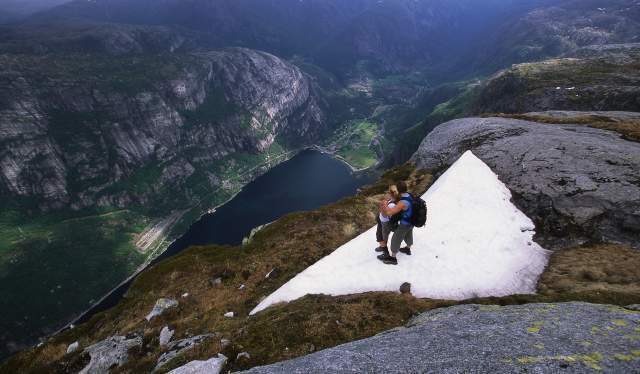 Before the county road between Sirdal and Lysebotn opens around the middle of May, Kjerag is considered to be accessible only to guests with special equipment, accompanied by a tour guide. The snow is deep and skis or snowshoes are required. The season ends when the road closes for the season due to snow conditions in October/November. hike even for experienced hikers. The starting point is at the parking lot at Øygardstøl. Ask the staff in the parking lot about the current conditions – they will give you all the information you need. Be especially aware if it rains as the trail can get slippery. Pack a 30-litre backpack to be sure that you have enough room for everything you need in the Norwegian mountains. A map and compass, first-aid equipment, a fully charged mobile phone, and a headlamp are just some of the things we recommend you keep in your backpack. Scroll down the page for a complete packing list. Always bring suitable footwear. Hiking boots are recommended. The hike to Kjerag goes across rough terrain, and you will need ample foot and ankle support. Occasional strong gusts can occur at Kjerag, so please use wind and waterproof outerwear. An extra set of clothes including a cap, a scarf, and gloves or mittens belong in your backpack. You can take the car ferry from Stavanger to Lysebotn and continue from there to Øygardsstøl by car or taxi. 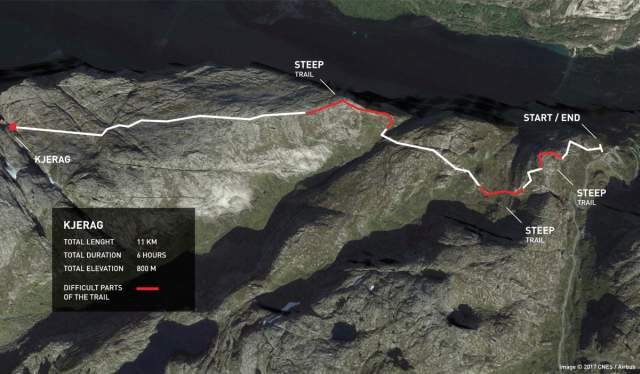 You can also drive towards Lysebotn via Sirdalen. In the summer, there is a bus service to Kjerag/Øygardsstøl from Stavanger. The bus departs early in the morning and returns to Stavanger in the afternoon. Explore the alternatives for getting to Kjerag and around. See Kjerag tourist information on Facebook for the latest updates. Always bring enough food and drink when you set out on a trip. It is important to have enough refills to make sure your energy reserves last all the way. If you are inexperienced or feel unsure about doing the trip, we recommend that you join a guided hike. A good guide can turn a bad day into a fantastic experience. There are many other hikes around Kjerag and in the nearby areas, including easier options. Check out the hiking alternatives in the area. Even if sunshine and fair weather are predicted, the weather conditions can change quickly. Always check the weather forecast before you start your trip, and talk to the locals about what kind of weather to expect. They will often know if there is a risk of rain and windy conditions even if the weather forecast is promising. Weather forecast from Yr, delivered by the Norwegian Meteorological Institute and the Norwegian Broadcasting Corporation (NRK). Download Yr’s free weather app for iOS or Android. With a good backpack filled with the right equipment, you have a great base for a wonderful experience in the mountains. Choose a backpack with a volume of 30 litres to be sure to have enough space for everything. Every year, Norwegian volunteer rescue crews go into the mountains to retrieve travellers who have lost their way, are tired or injured or have encountered problems after dark. These travellers are often dressed in everyday clothes and lack suitable equipment. Research the length, duration, and recommended physical conditioning for the hike you want to do. Check the weather conditions and always listen to local mountain residents. Buy or rent the right equipment for your trip. Always bring enough food, drinks, and an extra change of clothes in your backpack. Check out the possibility of joining a guided tour. Don’t wear jeans, trainers, or other everyday clothing. Don’t start your trip too late in the day, as you might risk having to hike in the dark. Never start your mountain hike without being in good enough physical shape. Don’t depend on a map on your mobile device as there is not always coverage in the mountains. Don’t leave anything, including trash, behind. Every year, Norwegian volunteer rescue crews go into the mountains to retrieve travelers who have lost their way, are tired or injured or have encountered problems after dark. These travelers are often dressed in everyday clothes and lack suitable equipment. Go hiking in Norway and discover why the locals can’t get enough of nature. Our most scenic landscapes are definitely best enjoyed on foot. With almost 300 mountain peaks above 2,000 metres and numerous peaks, plateaus, and hills below, the Norwegian mountains can be as challenging as you want them to be.